In ongoing efforts to help promote Wenatchee Valley trails and the sport of trail running, Run Wenatchee played host to Portland-based ultra runners Yassine Diboun and Willie McBride on April 20-22. 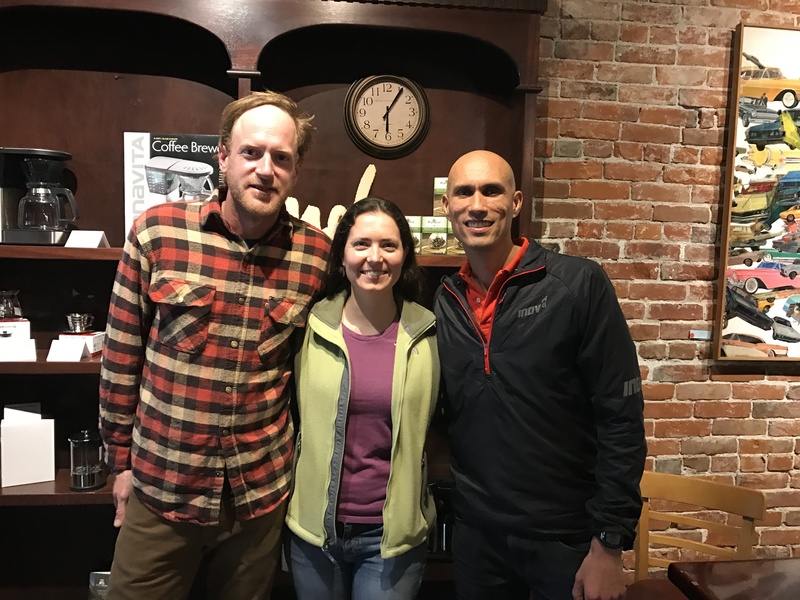 Diboun and McBride, co-founders of Portland’s Wy’east Wolfpack running club, offered a slideshow and chat session on the sport and a trail running clinic for those interested in becoming better trail runners. The weekend kicked off Friday evening as runners and fans gathered at Mela Coffee Roasting Co. for Diboun and McBride’s presentation, “The Yin & Yang of Ultra Running.” Diboun, 39, led with a recap of his running experience ranging from overcoming substance addiction and abuse to a gruesome triathlon training injury to his success on the trails. His successes include a win at his first 100 mile race, the Virgil Crest 100 in 2008, several top five finishes at the White River 50 Mile, Gorge Waterfalls 100K and others, and a top 10 finish at the prestigious Western States 100 in 2013. The move from upstate New York to his current home in Portland gave Diboun the opportunity to not only meet McBride on local trails but to grow his passion for trail running into a partnership and company, coined after the native term for Mount Hood. Wy’east Wolfpack offers a local weekly social run, group training, and personalized coaching. Willie McBride, left, RunWenatchee’s Chelsea Lenderman, and Yassine Diboun, right, pose for a photo prior to the start of their presentation at Mela Coffee Roasting. McBride, 36, followed Diboun to the stage at Mela and outlined a different approach on the subject. His experience with the outdoors came early on in childhood, spending summers in the Yosemite region of California. After suffering a painful 50-foot fall while climbing, McBride shifted his attention to trail running, fast packing, and self-propelled adventures. He chatted about crossing fatally sized crevasses during the Ultra Fiord 110k race in Patagonia, Chile, his experiences and opinions with longer ultras such as the Tahoe 200 (8th place, 2014) and the Fat Dog 120 (5th place, 2013), and treks through the Bailey Traverse, Sierra High Route, and Cordillera Huayhuash in Peru. Runners learn the mountaineer’s technique to efficiently hike up hill during the trail running clinic at Horse Lake Reserve. 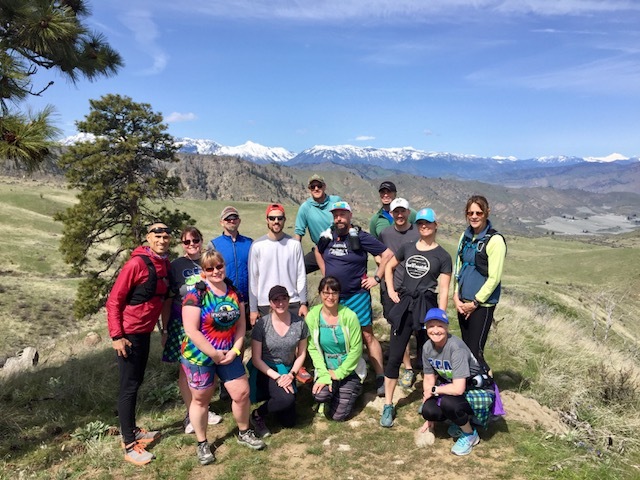 On Sunday morning, fresh off finishes at the Yakima Skyline 50k the previous day, the pair returned to Wenatchee to host a trail running clinic at the 1,700-acre Horse Lake Reserve in the Wenatchee Foothills. 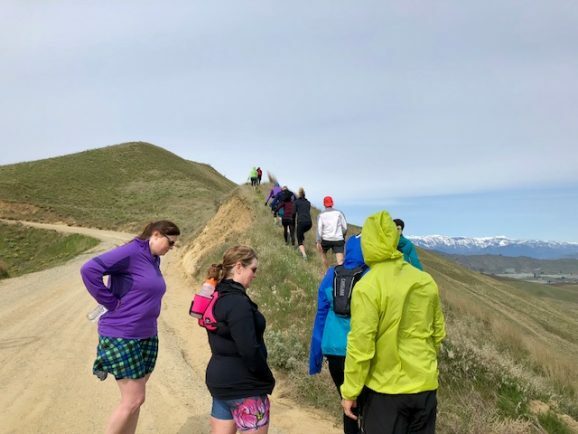 About a dozen runners, primarily from the Wenatchee Valley but also several from the Seattle area, bundled up in windy conditions to learn ways they can improve their trail running skills. Here is some video and drone footage of Sunday’s clinic. Willie McBride, left, consults with Yassine Diboun over a trail running technique on the Homestead Trail at Horse Lake. The three hours at Horse Lake was double the time normally allotted by Diboun and McBride for their clinics. The weather eventually broke, opening up to sunny skies, calmer winds, and clear views of the Cascades. At the conclusion of the weekend, runners thanked both of the Wy’East Wolfpack founders for the services they provided and regaled in the information received. Run Wenatchee would like to thank again Diboun and McBride for making the trip from Portland. Interested in following their future adventures? They are active on social media with the handles @yassinediboun and @wyeastwolfpack. 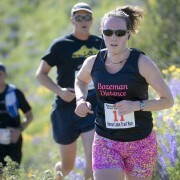 Run Wenatchee will be hosting another ultra runner, Max King, on May 9-10. 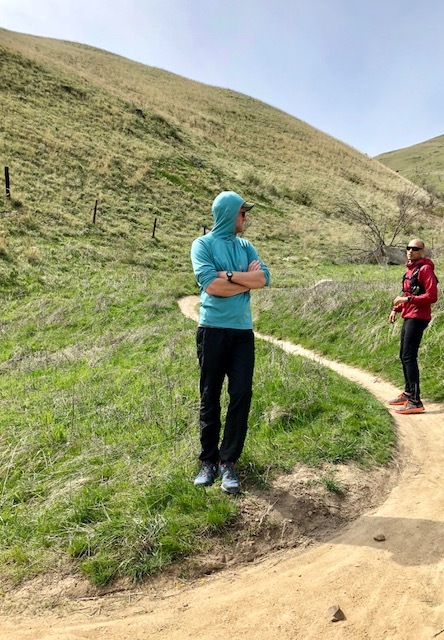 King will put on a trail running clinic on May 9, starting from the new Saddle Rock Trailhead in Wenatchee. The following day, from 4 to 6 p.m., he will participate in a Salomon shoe demo during RunWenatchee’s Run Club at Pybus Market. King will be discussing essentials to bring for trail running and how to cope in various climates. Kyle Almekinder lives in the Wenatchee Valley and is an avid trail runner.